When Lawrence Cannon, Bev Oda and Peter MacKay lined up together to be interviewed on the Ottawa political shows staged by two of the major networks earlier this week, they were doing what was necessary to bring the right balance to the newest Afghanistan developments. And the Liberal and NDP leaders, Michael Ignatieff and Jack Layton, were playing their parts as well, to respectively support and criticize the government’s move to enact a non-combat role for Canadian troops in Afghanistan next year. Not to say “I told you so,” but it can be noted that, in this space, such scenarios had been envisaged in last week’s OttawaWatch. The significance of the foreign affairs, international development and national defence ministers (Cannon, Oda and MacKay, respectively) appearance together bears out the ‘3D’ concept — the complementary roles of defence, diplomacy and development that have been an emphasis since the beginning of Canada’s Afghanistan initiative. The support of Ignatieff has him playing the ‘strategic coalition’ role which is so often necessary to a nation’s international relations initiative. He saves his most critical lines for suggesting that it is about time the government listened to what he alleges the Liberals have been saying for months. The cynical call this a ‘deal,’ and suggest darkly that the Liberals and Conservatives are in some dark coalition. I would modestly suggest it is domestic diplomacy in its highest form. Playing the role of head cynic is the NDP leader. And it is natural for him to do so, because he represents a perspective that must, by legacy and philosophy, be more opposed to war than in favour, even if the war is just or necessary. Layton does bring necessary points to the argument. He keeps the Con- Lib “coalition” feet to the fire, not letting them forget certain factors for a moment. Those factors are that, at the end of the road, helping to rebuild Afghanistan and its people takes development and diplomacy, well ensured by a well-trained and capable Afghan military and police force, and a justice system that backs up both. For a change of pace, let’s shift from politics to books and authors. I became reacquainted with Grace Eno while researching her father, the late J. B. Rowell, founding pastor of Victoria’s Central Baptist Church, where I occasionally attended as a young lad. Now in her 80s, she has turned her natural talent and cadence as a poet into a small volume entitled The Little House Aglow: Radiance to All, a Treasury of Poems. Her arrangement with First Choice Books is to release 50 copies at a time. She has circulated copies to friends and family members, and will be pleased if the volume gets a little more attention. A poet I am not (although I am told I have feet like Longfellow’s), so I won’t try to critique her writing. But it does have both a naturally congenial and spiritually authentic flow. People wanting to learn a little more about Eno and her poetry should go to firstchoicebookstore.com. The second author for attention in this space is James H. Wardroper. I first met him when he was a Vancouver-based engineer and technology teacher who founded and developed Africa Community Technical Service. He now lives in the Muskoka area of Ontario and has been working to turn his lifelong interest in scripture and history into a series of historical novels about the gospel and tribalism in England’s 3rd to 15th centuries. I reluctantly cracked open The Michmash Chronicles, Book One, entitled Bearers of the Light. But I was quickly pulled in by the author’s crisp narratives, and sense of the spiritual and military conflicts that possessed politics and religion in the third century of the Christian era. And I found myself constantly asking what lessons could be learned that could apply, for example, to Canada’s role in Afghanistan. While the science and technology of warfare is different today than it was so long ago, Wardroper convincingly builds the case that faith, sociology and history have ways of repeating themselves almost endlessly. One can find out more about this book from: essencebookstore.com. 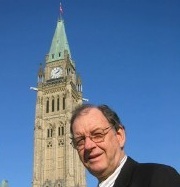 Lloyd Mackey is a member of the Canadian Parliamentary Press Gallery in Ottawa and author of Stephen Harper: The Case for Collaborative Governance (ECW Press, 2006), More Faithful Than We Think: Stories and Insights on Canadian Leaders Doing Politics Christianly (BayRidge Books, 2005) and Like Father, Like Son: Ernest Manning and Preston Manning (ECW Press, 1997). Lloyd can be reached at lmackey@canadianchristianity.com.